I've mentioned a couple of times over on Twitter a new table top game called Wild West Exodus (and been slightly spamming folks on gaming nights with pictures of games!). 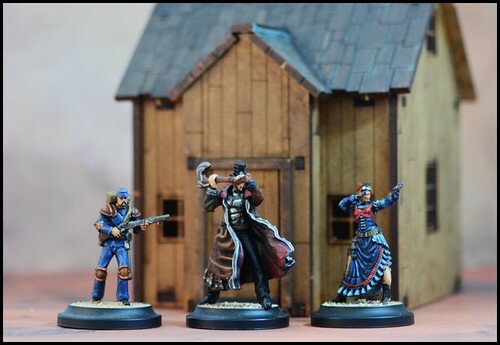 The folks at Outlaw Miniatures have created a kind of Steampunk / Sci-fi hybrid western game. Nuclear power rifles, Abe Lincoln with a shotgun-axe, Nicola Tesla in a dreadnought style walker, Thomas Edison using sound-waves to assault Billy the Kid and a cyborg Jesse James are just some of the wonders you'll find in the game. Yes, it's totally insane, but all the more fun for it. Game wise, it sits somewhere between Warmachine and Infinity, being skirmished based, but also pseudo 'real time', with alternating moves. It plays out at a good pace, and is full of intriguing tactical choices. My impression so far is that all the characters are incredibly powerful when their strengths are leveraged well, and the game then hinges on the tactics of targeting and order of play. There are a lot of good design choices that present the player with interesting choices. So far there has been very few 'lulls' in the games we have played, and stalemates seem unlikely. As a designer I love to see those kind of choices being so consistently presented to the player. There are also some fun narrative scenarios in the rule-book that can spice up your gaming sessions. The game was launched on Kickstarter last year, but is now fully available and has a packed release schedule planned. You can find their website here for the lowdown. The sculpts are really nice, and the quality of both the plastic and resin miniatures is very high. They are also a ton of fun to paint! So if you are a tabletop fan and maybe out to experience a new game, this one is well worth checking out!